I’m in the process of moving all my photos over to Lightroom, a great software program for editing and organizing photos. I have a lot of images, so it’s going to take a while. In the meantime, I’ll be posting a random shot or two from the archives this week. Hope it’s not too jarring to see springtime photos in January. Azaleas in the National Arboretum. 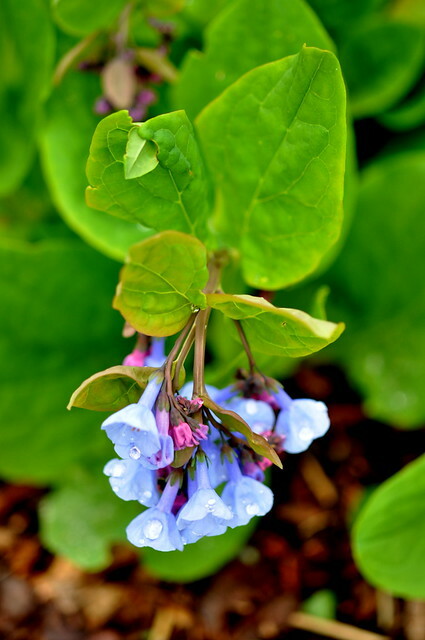 Virginia bluebells after a rain shower. This entry was posted in photography and tagged Mertensia virginica, salmon-colored azalea, Virginia bluebells. Bookmark the permalink. Not too Jarring at all considering the type of weather we have had here in the Mid Atlantic region. Beautiful pictures and thanks for sharing. I do hope to make it to the National Arboretum sometime in April. So true! This has to be the warmest January in D.C. history. The Arboretum is gorgeous in the spring. Not jarring at all, Carole. Even though I am spoiled rotten and in Fort Myers until March, I WANT to see your Spring pics and anything else you wish to post! Thanks, Cheryl! One good thing about this project is that I’m finding shots that were forgotten when I was doing the 365. Nice to find the forgotten shots! Please keep ’em coming! I’m doing something similar, transferring all high resolution photos to a dedicated external hardrive. It has been nice, Cheryl. I thought I had around 4,000 photos–I have 13,000. Just never had the time to do this before. It is never jarring to see spring flowers! Thanks! They are lovely. I especially like the second one with the intense colors and the rain drops. When I look out of my window it is actually snowing and the temperature is dropping. They have announced Russain weather. Sounds promising. Bring on the spring flowers. We haven’t had any real snow all winter! It is kind of strange for the East Coast. More flowers to come. . . . Feels like spring is right around the corner. I saw a few green shoots of tulips in my neighbor’s garden this morning! Daffodils are halfway out of the ground here. Wonder if they’ll survive? 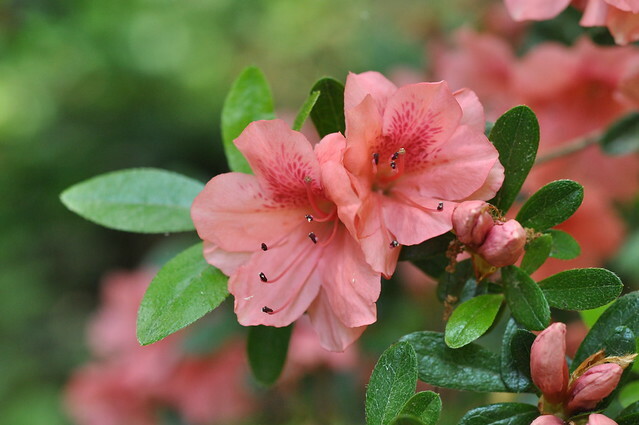 Well, azaleas remind me of home – Sydney, Australia; it is summer somewhere else in the world! Lovely shots! Thank you. Have always wanted to see Sydney. *sigh* I miss azaleas. No one seems to grow them out here – they part of the beautiful springtime in Philly. That’s a lovely pink. I think it may be too warm for azaleas in California. They require some cold weather in the winter. Same for peonies.